The Sunpan Gustavo Adjustable Bar Stool offers comfortable seating for your bar or pub table, without compromising on contemporary style. This stool features a sleek and clean geometric design perfect for modern spaces, and neutral enough to fit in with many contemporary decors. 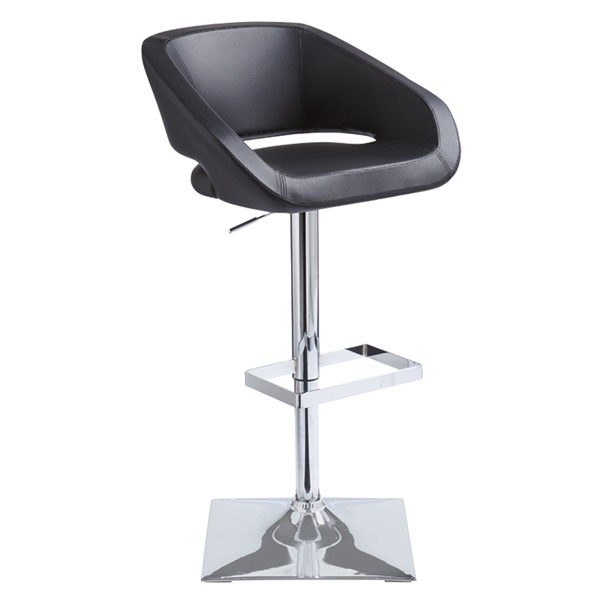 The stool features a square chrome steel pedestal for optimum support and durability, and an adjustable base for custom positioning. Its angled seat is attractive, with a slender cutout for a distinctive touch of artistry. Thick padding makes sitting in this stool a comfortable treat, and smooth, soft faux leather upholstery offer a touch of sophistication and a seat surface that�s easy to clean and care for. Choose from several different colors for a look that�s just right. What is the weight limit on this bar stool? The weight limit of the Gustavo Adjustable Bar Stool is 250 lbs.